Uploaded by Micah Wade on 2019-02-22. The first thing that jumps off the tape when studying Trysten Hill is his first step quickness at the snap of the ball and his burst to get upfield. He is scheme diverse, but projects better as a 4-3 defensive tackle. Can play the one-technique or the three-technique in a 4-3 defense, but is at his best as a one-gapper. Hill plays with a nonstop motor and high energy down after down. Doesn't take any plays off. Shows the ability to fight off blocks. Always working his hands and feet to free himself. Is equally disruptive harassing the quarterback as a gap penetrator and in the running game playing sideline to sideline. Shows good agility and flexibility to bend and finish tackles behind line of scrimmage and in the open field. Can anchor down against double teams, but needs to improve his overall play strength. Uses a twitchy arm over and spin counter move to penetrate the gap as both a pass rusher and run defender. There are questions about Trysten Hill's maturity, work ethic, and coach ability. 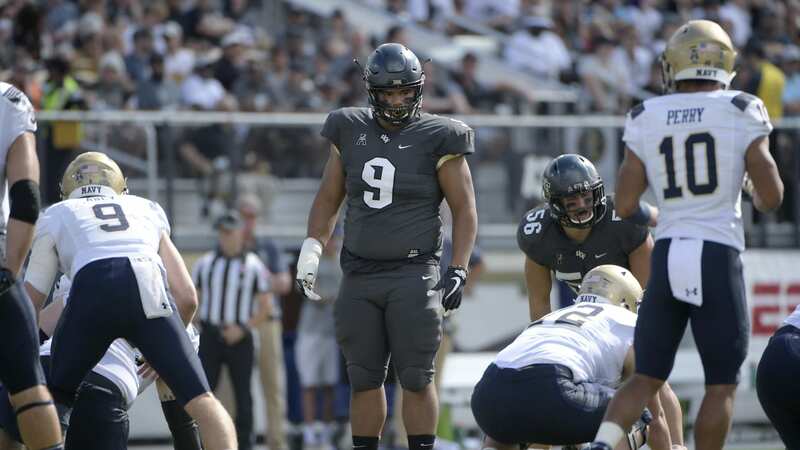 He found himself in the doghouse last year at Central Florida and only started one game. Was he demoted because of the new coaching staff or are the character concerns about him factual? This is something teams will have to dive deeper into. Needs to do a better job of playing under control. Will run himself out of gaps at times, which causes him to lose his gap responsibility. Can get washed out of the play by down blocks. Needs to develop a better feel and response to keep that from happening. Can anchor down against double teams, but needs to add functional strength in order to become more consistent. Drops his head at times on his initial punch. Needs to develop a more diverse pass rushing repertoire. Relies too much on arm over and spin move. Trysten Hill is a versatile defensive tackle capable playing the one-technique or the three-technique in the Dallas Cowboys 4-3 defensive scheme. Due to his first step quickness and high motor, he is likely better suited to play the three-technique. He has starting potential, but would likely be a rotational piece on the DL as a rookie behind Maliek Collins. His ability to play on the other side of the line of scrimmage and sidelined the sideline would be a welcomed addition along the Cowboys defensive front. He projects as a late Day 2 or early Day 3 draft pick, and that's exactly where the Dallas Cowboys would likely have to target him to acquire his services. Some have argued that the words "kicker" and "punter" don't belong in the same sentence as "NFL Draft." But just last year, six special teams players were drafted by NFL teams. Could the Dallas Cowboys consider such a player with one of their 2019 draft picks? From 2009-2018, various teams have drafted 19 kickers and 18 punters. The highest pick was a second-rounder; Tampa Bay's selection of Roberto Aguayo in 2016. Outside of one pick in the third round and another in the fourth, the other 34 picks have all been in rounds 5-7. The Dallas Cowboys have only contributed on pick to this total. In 2009 they selected David Buehler in the fifth round, two years after using a sixth-round pick on Nick Folk. Ten years later, could Dallas finally use another draft pick on special teams? There are a few of factors that make this possible. For one, the Cowboys are already fairly loaded with talent across the roster. A late-round pick spent at any number of positions would have a hard time surviving final cuts. Second, in terms of the quality of player versus the round, there's no better value than on special teams. You can possibly get the best kicker in the country in the fifth or sixth round; no other position offers that. Lastly, and most importantly, the Cowboys have a pretty clear opportunity to upgrade at kicker. They also could use the draft to save some cap space by making a change at punter. As I've written about before, Brett Maher was a Jekyll & Hyde kicker in 2018. He was brilliant from long range but a major liability closer in, and his 80.6% total field-goal accuracy was near the bottom of the league. While Maher's distance is a true asset, does it outweigh the risk of him missing a game-winning FG from 35 yards? And what about extra-point kicks, for that matter? Dallas should certainly bring Brett back in 2019 to compete for the job. Remember, he was still Dan Bailey's backup until close the start of the regular season. Perhaps a full offseason as the primary kicker would help him stabilize his game. But given the uncertainty, the Cowboys could easily justify spending a late-round pick at kicker. They could potentially land LSU's Cole Tracy or Utah's Matt Gay, two of the top prospects in this draft class. The worst-case scenario is that Maher beats one of these guys and you cut them. But there was a high probability that you'd have cut whoever you drafted at another position anyway. Essentially, you'd have spent a late draft pick as an insurance policy against Maher's development. That's not bad business. In fact, maybe you'd be able to trade that kicker at final cuts to a team who suffers a preseason injury or is otherwise dissatisfied at the position. There's a chance you could even recoup your draft pick. Another consideration is at punter. Chris Jones has been a very solid one for a while now, but he turns 30 in July and counts $2.3 million against the salary cap. Could the draft give Dallas a chance to get someone younger and cheaper? Let's say Dallas drafted one of the nation's top punters like Jack Fox out of Rice or Stanford's Jack Bailey. They'd have that player on a four-year rookie deal costing roughly 20% of what Jones' does. Dallas could trade or release Chris Jones for $800k in 2019 cap relief, or $1.8 million if he's cut after June 1st. That would push $1 million of dead money onto the 2020 cap. Those aren't big numbers, so the real gain here is if you think one of the top rookie punters could match or even exceed Jones' play. Then you've got that player on the cheap for the next four seasons. I would not predict that the Cowboys will spend a draft pick at either kicker or punter, but the point of all this is that you can't entirely dismiss it. 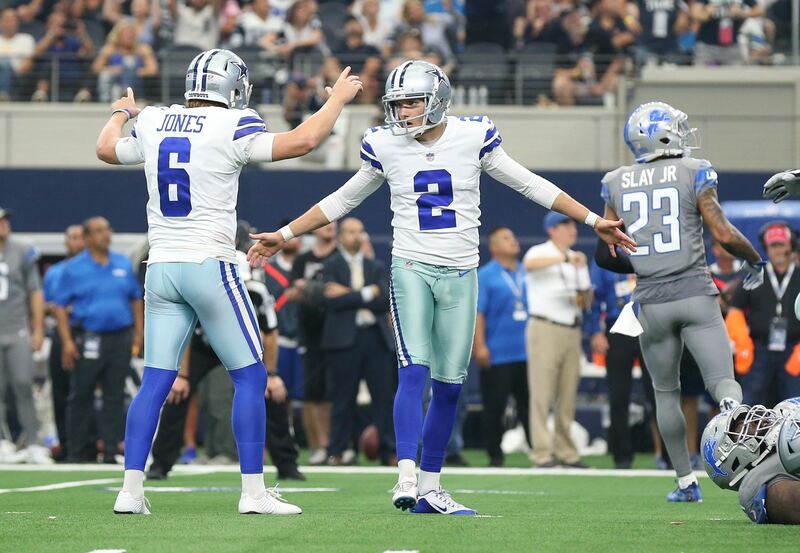 2019 presents the right mix of circumstances for Dallas to consider it more than they have in the past, especially considering how long Dan Bailey was a fixture on the roster. Brett Maher doesn't enjoy that same status. Dallas could easily look at some of the top kickers available and think that an upgrade is possible. Will that lead to the Cowboys spending a draft pick on special teams for the first time in a decade? * The Cowboys don't currently have a 6th-round pick, but could acquire one in a potential trade. It has somewhat flown a little bit under the radar, but Dallas Cowboys Passing Game Coordinator and Defensive Backs Coach Kris Richard has been touring around the country working out several cornerbacks in this year's draft class. With Byron Jones and Anthony Brown entering into the last year of their contracts, it wouldn't be all that surprising if the Cowboys draft a CB at some point in the 2019 NFL Draft. With that in mind, I thought it would be a good idea to share with you some of the cornerbacks the Dallas Cowboys could target in each round in which they hold a draft pick. In order to keep it as realistic as possible I tried to narrow it down to the potential CB prospects that fit Richard's parameters. We all know he likes those tall, lengthy defensive backs and that's what I tried to focus on. 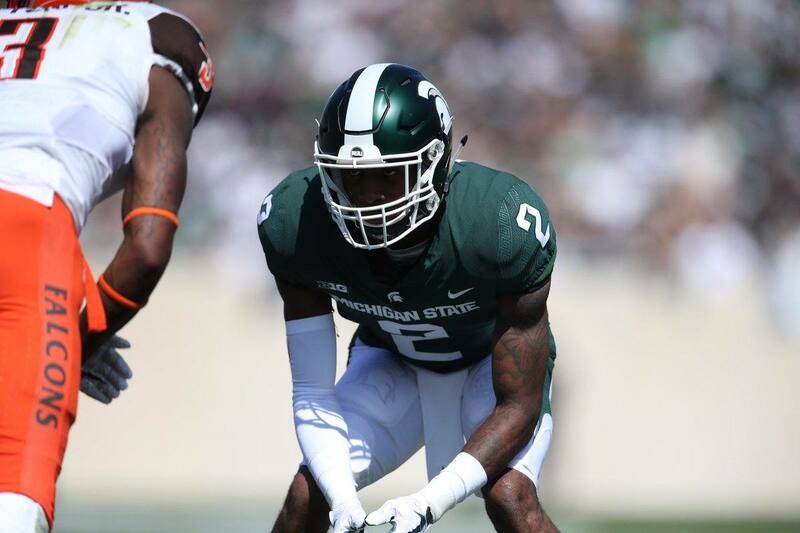 Justin Layne was a four-star wide receiver recruit coming at a high school, but ended up becoming a three-year starter on the other side of the ball at cornerback during his time at Michigan State. He has tremendous ball skills due to his background at receiver and has the size and length (6'1", 192) Kris Richard covets in his defensive backs. He needs to continue to improve is overall technique, but he has Day 1 starting potential. Joejuan Williams was a two-year starter during his time at Vanderbilt and primarily played press and off-man coverage. At just a smidge under 6'4", Williams typically towers over the wide receivers he faces, which has allowed him to find success at this point because of his mere size and length. He has the skill set and athleticism to become an eventual starter in the NFL, but really needs to develop his mechanics and the mental side of his game a little more. After overcoming three major knee injuries earlier in his career, Jamel Dean eventually became a two-year starter to finish his career at Auburn. He has elite size (6'1", 202), length (31 3/4" arms), and speed (4.3 40-yard dash), but his durability is a red flag moving forward. He also needs to play with a little better mean streak, especially in press man coverage. The talent is there though and he has a chance to develop into a really good starting CB if he can stay healthy. Isaiah Johnson is another player with elite size (6'2", 208), length (33" arms), and speed (4.4 40-yard dash) at the cornerback position and is someone Kris Richard has met with and worked out on a number of occasions. Johnson was a former three-star wide receiver recruit coming out high school before making the switch to CB his final year in Houston. He played mostly bail technique for the Cougars and is still really raw as a CB prospect, but he has immense upside. He will likely need a year or two to further develop his craft before he can be relied upon. Kentucky CB Lonnie Johnson Jr. There are actually three Kentucky defensive backs the Dallas Cowboys could target, but Lonnie Johnson Jr. is the top-ranked prospect so far. He has the size, length the Cowboys are looking for, but he really needs to refine just about every aspect of his game before he's ready to compete at the next level. 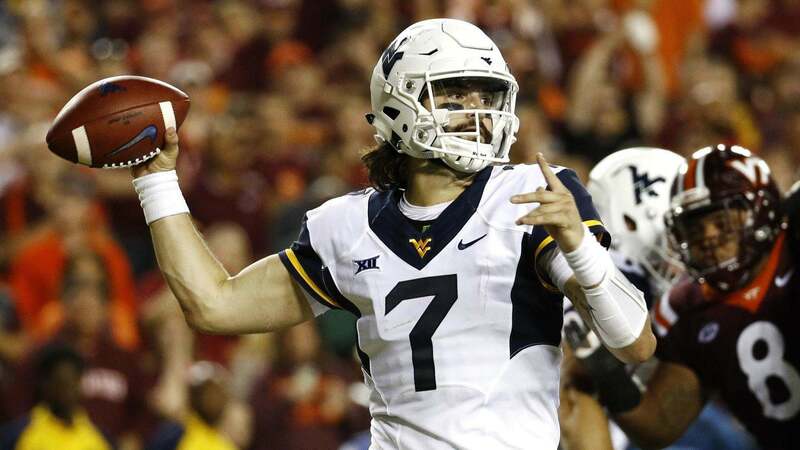 He has tremendous instincts which has gotten him to this point, but he's going to have to develop both technically and mentally if he wants to find any kind of success in the NFL. All of the tools are there though. Jordan Brown was a three-year starter at South Dakota State, playing primarily press and off-man coverage. He has the size, length to play as a boundary corner in the NFL, but only has average top end speed. He is a competitor with a scrappy mentality that unfortunately runs a little hot and cold at times. He plays with good balance when making his transitions, which allows him to stick with receivers. Overall, he is a solid developmental mid-round pick with starting upside. Michael Jackson was a two-year starter at Miami on the right side, playing mostly press man. He is a good-sized athlete with the kind of length and athleticism Kris Richard is looking for in his cornerbacks, but he has shown a tendency to struggle against savvy route runners. He's not the most fluid of athletes and will struggle in his transitions, so he might fit best in a defensive scheme that plays a lot of zone or cover 2. Kris Boyd was a three-your starter during his time in Texas and played on both the right and left side, often times shadowing the opposing team's best wide receiver. He plays with the desired competitive nature and checks all the boxes as far as size, speed, and athleticism are concerned for a starting caliber cornerback. But, he plays undisciplined and doesn't trust his eyes, often times causing him to arrive late with his reads. If he can become more disciplined he could be a steal this late in the draft. Chris Westry was a three-year starter at Kentucky, but gradually started to see his playing time decrease with the emergence of Lonnie Johnson Jr. and Derrick Baity Jr.. At 6'4", 199 pounds and legitimate 4.35 speed, Westry has extremely rare size and speed for the cornerback position. Unfortunately, he is a better athlete than he is a football player right now and might be nothing more than a developmental project. Derrick Baity Jr. worked his way into the starting lineup at Kentucky as a freshman and ended up becoming a four-year starter. He has excellent size for the position (6'2", 197) and is light footed with good ball skills, but he doesn't play with the kind of physicality you'd think from my player his size. He is an untrustworthy tackler and undisciplined with his fundamentals. His size and ball skills should get him drafted, but he might be nothing more than a developmental project. Dak Prescott is the current and future starting quarterback of the Dallas Cowboys. Let's make that clear. Prescott has done more than enough over the first three years of his career to earn this "franchise quarterback" title, and the contract he will eventually receive from the Cowboys' front office. But that doesn't mean the Cowboys shouldn't consider drafting a quarterback this year. Or next year. Or the year after that. Quarterback is the game's most important, and highest paid, position. It's the position where a player can most greatly effect a game individually, both positively and negatively. And it's the position you must make sure is accounted for heading into any new season. Yes, the Cowboys clearly trust now fourth-year quarterback Dak Prescott, but adding talent to your QB room is never a bad thing. In fact, it's typically a great thing. Behind Prescott are Cooper Rush and Mike White. Rush beat out now-offensive coordinator Kellen Moore for the backup job during the 2017 preseason, and then held off rookie Mike White in 2018 to maintain the job. When the Cowboys drafted White, however, they had dreams of a new backup quarterback in mind. White didn't perform as well, or progress as quickly, as some had hoped leaving Cooper Rush as the unquestioned QB2, however. Is Cooper Rush good enough, though? This is a question which really is yet to be answered. And if the Cowboys have it their way, it will never be truly answered. He was excellent during the 2017 preseason, no doubt about it. But he was, well, bad last year. Rush and the offense struggled mightily during the preseason, and while lack of offensive line depth didn't help him, Rush's play didn't spark much optimism or excitement either. The Cowboys would be wise to consider drafting a quarterback later in the 2019 NFL Draft, but they shouldn't spend too much time worrying about it either way. The backup quarterback, especially behind Dak Prescott, will bring his value in terms of game-planning and aiding Prescott, rather than with his actual arm talent.